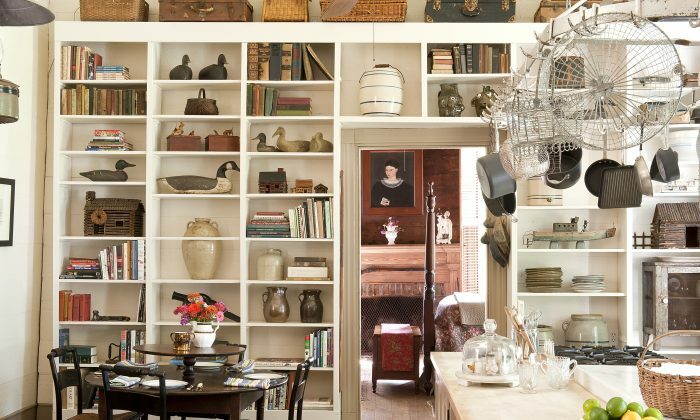 No room is complete without something of age and provenance and character. The trick to blending old and new in your home’s decor is careful curating—and keeping an open mind, says Sully. The book includes the dining room of a Federal Revival home in Birmingham, Alabama, where a wall lined with gilded, leather-bound books and two sleek contemporary glass vases adds a warm yet airy backdrop for a heavy, dark-stained English library table. It’s surrounded by light-coloured Hepplewhite-style dining chairs beneath an ornate Italian chandelier. The parlour area in an 1880 home in San Antonio, Texas, features high Victorian detail and white furniture juxtaposed with strong colours in a series of Josef Albers lithographs. They share a corner with a small pile of painted wooden cubes found in an antique shop. “I’ve always been interested in having at least one modern piece of furniture or contemporary painting in each room, so the house doesn’t look like a museum,” said the homeowner, banker, and art collector Carl Groos. Sticking to a palette of taupe, gold, and brown allowed them to bring together pieces from different continents and centuries in an elegant and understated way, they said.